During the Seattle Seahawks tenure at the Kingdome, the stadium was generally depicted as rather ugly and not favored by many fans. Discussion of building a dome stadium for a professional team was first deliberated in the 1960s. The location of where such a stadium would be constructed was the most debated issue. Finally in 1972, a site for a dome stadium was selected in southern downtown Seattle. During the same year, a group of businessmen from Seattle announced their intentions to obtain a NFL franchise. After much debate, construction of a dome multipurpose stadium officially began on November 2, 1972. The dome was completed by March 1976. The stadium was named Kingdome due to it’s location in King County, Washington. By 1976, Seattle was awarded both a football team (Seahawks) and a baseball team (Mariners). 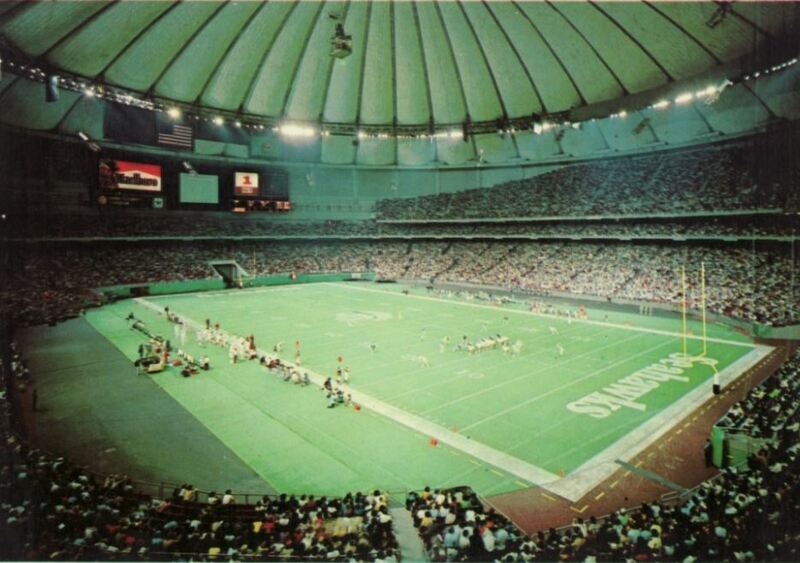 The Seattle Seahawks played their inaugural first game in front of 66,000 fans at the Kingdome on September 12, 1976. The Kingdome was a large stadium consisting of three tiers of seating. The first and second decks circled the entire stadium and the upper deck extended nearly 80 percent around the stadium. The main video/scoreboard was located over the south end zone seats. The Kingdome was a very cavernous stadium, with the dome roof 250ft. over the Astroturf playing surface. The Kingdome underwent very few changes during its existence. In the 1990s, the Seahawks and the Mariners lobbied to have new stadiums built for them. Both teams succeeded in getting new stadiums. The Mariners moved out of the Kingdome during the 1999 MLB season and moved into Safeco Field. However, in order for the Seahawks to move into a new stadium, they had to first move out of the Kingdome so it could be imploded and a new stadium be built. The Seahawks played their last game at the Kingdome on December 26, 1999 against the Kansas City Chiefs. The Kingdome was imploded on March 26, 2000. During the 2000 and 2001 seasons the Seahawks temporarily played at Husky Stadium, home of the Washington Huskies. In September 2002, the Seahawks moved into their new stadium, CenturyLink Field.